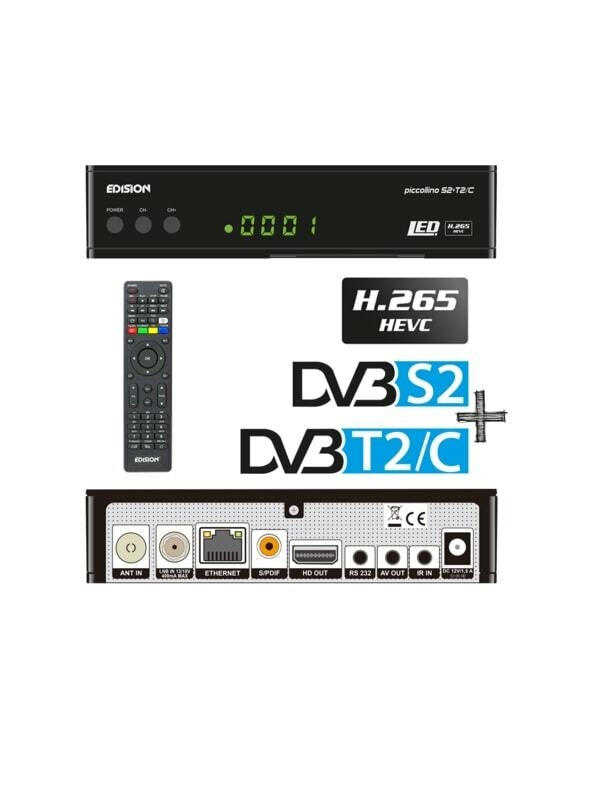 Piccollino S2+T2/C is the new compact EDISION H.265/HEVC COMBO receiver with Card Reader, two tuners, one satellite for DVB-S & S2 and one HYBRID for DVB-T/T2 and DVB-C. It features new processor for fast menu and channel selection, while it can store up to 6000 channels. The LAN port at 100Mbps offers access to web applications and along with its Media Player functions , in combination with its elite IR remote control, it will provide you with even more fun and enjoyment of your favourite programs and functions. Of course, it comes with the trusted EDISION guarantee and support. 1 x HDMI output for High definition video/audio. Software upgrade & backup/channel list, via USB.